Click Here for a Tutorial on Setting up a Stunt Bike the right way and how to choose the right Sprockets and Chains! Sprockets/Chain - What sprockets do I need for my bike? Great question. A quality sprocket and chain kit comes in at #3 on the important stunt equipment scale. You really havent dedicated yourself to technical stunting until you put some aftermarket stunt sprockets on your bike. Generally we have 3 stages for choosing the right sprockets. For the general street rider who just wants to power the bike up, get out of the hole faster, and not sacrifice streetability, our Power Up Kits are where you need to be. The most popular gearing for these riders are -1 front, +2 rear. Our 'Power Up' Kits can be found Here! Remember, going down 1 in the front is equal to going up 3 in the rear! For the professional stunter or bikes that are limited to parking lots or closed courses only, we recommend our Pro Stunt Drive Kit which is generally an increase of about 20-22 teeth net in the rear. For most bikes this will put you in the 60 tooth range. Go big or go home, right. You can also custom select your own 60+ Tooth Kit with our Vortex Stunt Sprocket Kits. Click This Link to view our OEM Chart to see what sprockets and pitch your bike has. Motorcycle Chain Lengths. Click Here to see how many links you need after purchasing aftermarket sprockets. PLEASE NOTE: We send ALL of our Thrust Company Drive Kits with the appropriately rated chain already cut to length in our shop!! Why convert to 520 chain and sprockets? Depending on the bike and what size you are converting from you can gain 4-8 hp just by putting a good quality 520 chain and lighter sprockets on the bike. The lighter chain and sprockets create less centrifugal force which lets the motor spin them easier. For stunting, the smaller pitch causes less drag. Most good 520 chains are rated to 750cc but there are ones rated to 1000cc also. What’s the difference between 520, 525 and 530? Pitch can be characterized by the thickness and weight of a chain. The first digit (5) indicates the center-to-center distance between chain pins. The second and third digits (20, 25, 30) indicate the chain’s width, measured between the inboard surfaces of the inner sideplates. Because wider chains are typically stronger, the second and third digits also indicate a chain’s strength. Higher numbers correspond to greater strength, i.e. a 525 chain is stronger than a 520. This additional strength is achieved through increased roller diameter, pin diameter, pin length and plate thickness. Will take the most weight off of your bike and will increase horsepower, however it is important to note that by decreasing pitch, you can expect faster wear especially on bigger bikes because the drive forces are getting spread over a slightly smaller surface area. Middle of the road, standard chain that comes standard on most 600 and 750cc models. 525 is more durable, but heavier than a 520 conversion. The heaviest, thickest and most durable chain pitch. Comes OEM on most 900- 1400cc models. Don’t Forget! A worn or poorly maintained chain will wear an aluminum sprocket prematurely! If you can't find your bike model under the pitch you are looking for, chances are the manufacturer does not offer that pitch for your model. Please check out the other pitch options or email for assistance. What is the 'Gearing Ratio' and how do I find out what mine is? -The Gearing Ratio is the calculation between the front and rear sprocket sizes or your 'Final Drive Ratio'. This number is calculated by the rear sprocket tooth number divided by the front sprocket size. You can use a 'Gear Ratio Chart' to easily view what changes will be effective when changing the front and/or rear sprockets. For example: by looking at the gear ratio chart you will see that a 15/45 ratio (3.00) is the same as a 16/48 combo. By comparing the different ratios you can calculate for your model how many teeth to go up on the rear sprocket to equal what you've gone down in the front. Do you lose top speed when you lower the gear ratio through a sprocket change? You only start loosing top speed when you lower the final drive ratio so much that the rpm's are raised into the revlimiter or past peak horsepower in top gear. You can actually gain some top speed by lowering the ratio slightly. Do you carry every sprocket for every bike? -No. However, if we don't carry a particular size sprocket for a particular bike we will be happy to make it for you. 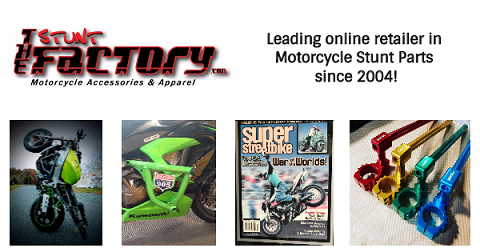 What we do carry are the popular sizes for the modern sport bikes, conversion kits, and stunt drive kits for these bikes. Can you custom make sprockets? -Yes. Given some specific information we can make any sprocket in any size. "I keep breaking teeth on sprockets" Or "Every aluminum alloy sprocket I put on doesn't last- Why?" -Broken teeth or fast sprocket wear are a result of a worn chain. Other than high miles on a chain, common factors in premature chain wear are a lack of cleaning and lubricating and/or not enough slack in the chain...aka-maintenance. When a chain becomes so stretched that it doesn't fit in between each tooth of the sprocket you will have tooth breakage as the chain comes in contact with the teeth at the wrong place at very high speed. Can you get chains in any size? -Just about. We stock all the popular sizes and finishes of chains and up to 150 link chains and can have cut any length in certain types. Can I change the chain and/or sprockets on my bike myself? -If you have automotive knowledge, or work on your car then you can change the sprockets on your bike provided you have the correct tools. Changing a chain is fairly simple but takes the use of a chai tool that is specifically designed to break the chain and then rivet the masterlink together safely and securely. If you need to have a shop change the parts for you they shouldn't charge more than a couple of hours labor to do so. When should I change my chain and/or sprockets? -If your bike has a 'wear indicator' label on the chain adjustments, it's pretty easy to figure out-Or if you have reached the back of the available adjustment then replace your chain. The noise a worn chain and sprocket will make is a sure tell-tale sign things are worn out and need replacing before a failure occurs. However, a worn chain may not make any strange or loud noises that you notice. There are a couple of other things you can do to determine whether it is time to change your chain. Your bike manual should provide you specifics on measuring a certain number of links and comparing that dimension to an allowable limit. 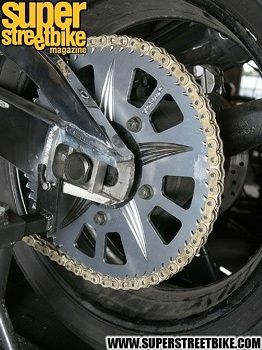 If it doesn't, a very easy test it to pull on the chain on the very backside on the sprocket. If you can pull the chain away from the sprocket more than a 1/16" or so then you should consider changing the parts. What this test will show is how worn the sprocket teeth are from their original dimension. When new, there should hardly be a noticeable difference in the fit of the chain rollers in the sprocket teeth- meaning there shouldn't be any forward-to-back motion. The amount of stretch determines your sprocket wear, which will tell you whether they are worn significantly. Sprockets don't wear themselves out. Worn chains wear sprockets out. The dimension of the chain determines the dimension of the sprocket teeth and the parts wear together. So, although a new chain won't have a huge effect on the premature wear of a sprocket, a new sprocket put on a worn chain will wear extremely fast. The better, stronger chain you can use the longer all the parts will last because the stronger chain will resist elongation and thereby sprocket wear. For these reasons, it is definitely a good idea to replace all the parts at the same time for optimum longevity. Why does my chain have a tight spot? -As you rotate the rear wheel to lubricate your chain or to check the chain's slack, you should always check the tension at several spots along the chain. A chain can develop a tight spot if a link or links are bound. This usually occurs because a seal has failed and moisture has gotten into the chain and rusted it, thereby freezing it. If left this way- it will break as this is now the weakest link in the chain. Most often though, a chain will actually have a loose spot. This commonly occurs from not having enough slack in the chain and being stretched by the forces of the suspension pulling on it. On most bikes, and especially modern sportbikes, the geometry of the suspension and drivetrain cause the slack to be taken out of the chain as the suspension compresses. So, if you don't have enough slack so that you still have slack when the suspension is fully compressed, you will stretch the chain when the suspension bottoms out, either from two-up riding and hitting a bump or putting all the weight of the bike on the rear wheel- as in wheeling. The worst thing you can do in this case is just keep tightening the chain to take the slack out of it as it stretches. Do I have to lubricate a sealed type ( O-ring, X-ring, W-ring ) chain? -Absolutely! You should follow the manufacturers instructions in order to get the longest life from your chain and your sprockets. Lubricating your chain helps keep moisture off- preventing corrosion. This also helps to keep the seals pliable and working good, and aids in grabbing dirt and grime and flinging it off- preventing it from tearing up the seals. It is best to lube your chain after riding- when it is warm and the lube can penetrate better. It also makes it easier to wipe the excess off. The best lubricant to use on a sealed type chain is a non-aerosol type. Will my speedometer misread if I change the gearing? -Yes. Unless your bike's speedometer runs off the front wheel, changing things like the gear ratio or even the air pressure in your tire will effect your speedo readout. However, these changes can be compensated for and you can get a correct reading with the installation of a Speedometer Calibrator.